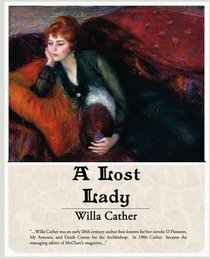 A Lost Lady research paper analyzes Willa Cather's novel about the life of Mrs. Forrester. Use this literature research paper topic suggestion to write a custom paper on Willa Cather's "A Lost Lady". Get started with great research paper topics from Paper Masters like the one you see here on Cather's famous American Literature classic. Mrs. Forrester is the lost lady of the title of Willa Cather's novel "A Lost Lady." She is at the center of the action, and her behavior and the reactions of the other characters, particularly Niel Herbert, to her suggest Cather's theme and perspective. Mrs. Forrester is lost, but she is not evil. Mrs. Forrester seems overwhelmed by what is going on around her. She tries to deal with it by opportunistically involving herself with situations and others, especially different men, whom she sees will help carry her through different disagreeable or unfortunate circumstances she faces. Cather portrays Mrs. Forrester as relatively refined and as considerate; however, Cather also shows her as weak. Contrasted to Mrs. Forrester is Niel Herbert, the nephew of Judge Pommeroy who is a friend of the Forresters. Niel is not portrayed as strong or heroic. Neither the circumstances nor the action of "A Lost Lady" call for such characteristics. The novel is a novel of social realism concerning the changes coming over the West in the middle decades of the twentieth century. The opening and exploration of the West was long over by this time. Even the settling of the West was mostly completed. Captain Forrester, however, Mrs. Forrester's husband, represents the earlier era of Western history when it was still being developed. Captain Forrester had been a businessman playing an influential role in building railroads in the West. Though this time of his life was over, he still enjoyed an affluent life and privileged position in the area. Mrs. Forrester enjoyed her privileged position as his wife. The Captain's stroke symbolizes the loss of the old way of life of the West and the virtues it took to survive and progress in settling it. The Captain's later death signifies the death of the old way of life. Although as seen by Mrs. Forrester's affair with a Frank Ellinger, a bachelor in his forties, she has been changing over to the new way of life taking over the West, the Captain's stroke and death accelerate this changeover in her. Her husband's stroke and death bring to the surface the behavior Mrs. Forrester is engaging in to adjust to the changes. Theme term papers analyze the element of literature and writing in which the moral of the story is conveyed. What is Evil Research Papers delve into the definition of evil along with other issues dealing with this term. The Affluent Society Research Paper explores a critique of this book by John Kenneth Galbraith who was a Keynesian economist. My Antonia by Willa Cather, custom written by Paper Masters and delivered to your e-mail. The Professor's House by Willa Cather research papers examine topics like Christianity and literary techniques. Choose Out Four Pieces of Literature - Choose out of Four Pieces of Literature Research Papers delve into a sample of an order placed on pieces of literature with specific questions to be answered. Setting - Setting essays discuss the literary element that helps define a short story or novel. Symbolism Literature - Symbolism in Literature term papers examine the use of symbolism in literature to convey deeper meanings in a story and to allow readers to look between the lines of a story. Blanche Dubois - Blanche DuBois research papers analyze the main character from A Streetcar Named Desire. Paper Masters writes custom research papers on A Lost Lady and analyzes Willa Cather's novel about the life of Mrs. Forrester.